Brotherhood Mutual and Unity Performing Arts Foundation present Praise Celebration 2019: A City On Fire! 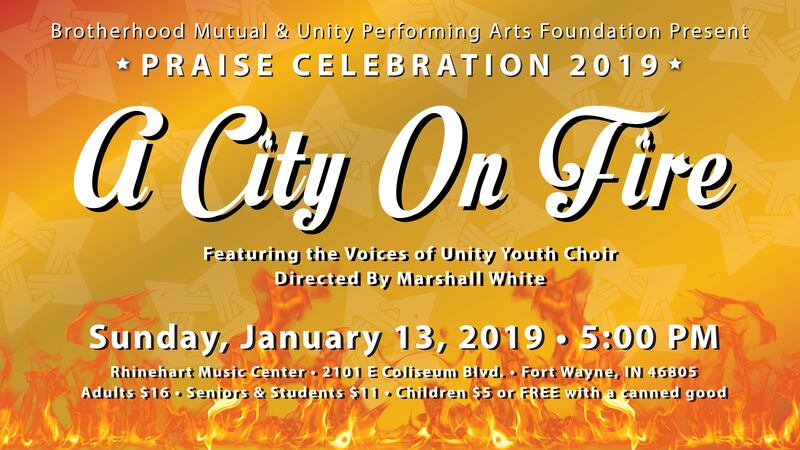 Join us for a night of worship at the Purdue Fort Wayne Rhinehart Music Center on Sunday, January 13, 2019 at 5:00 PM featuring the World Champion Voices of Unity Youth Choir and guest worship singers from our city directed by Marshall White! Children (12 & under) $5 or FREE with a canned good. To purchase tickets, CLICK HERE, or call the UNITY office at 260-481-6719.